Karpahtos is an island of the Aegean geographically belonging to the Dodecanese. Scarpanto, along with the southernmost island of Caso, is located on the sea route that connects Rhodes to Crete. The two islands mark the southeastern limit of the Aegean Sea. Scarpanto has a slender and elongated shape and is crossed by a mountain range whose highest point is the top of Mount Lastos (1,215 meters), more generally known as Kalì Limni, the highest elevation of the Dodecanese. In its northern part a very short arm of the sea separates it from the islet of Saria which belongs to it from a geographical and administrative point of view. The resident population is 6,000 inhabitants, a number that triples in the summer months. The climate of Scarpanto is typically Mediterranean. One of its peculiarities is represented by the meltemi winds that blow impetuously in the summer, affecting above all the western coast. The climate of Scarpanto presents a high humidity and a scarcity of rainfall during the winter. Unfortunately it's not possible to buy online the ticket to go to Karpathos. 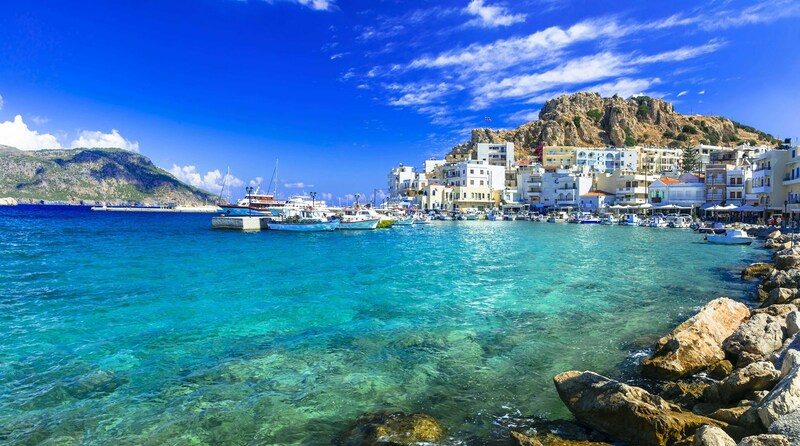 Do you want to travel with your family to get to KARPATHOS? Do you like adventure and freedom and you want to reach the destination KARPATHOS with your moto ?